Cakes, Cakes, and more cakes. The last month or so has been busy on both cake and family fronts. 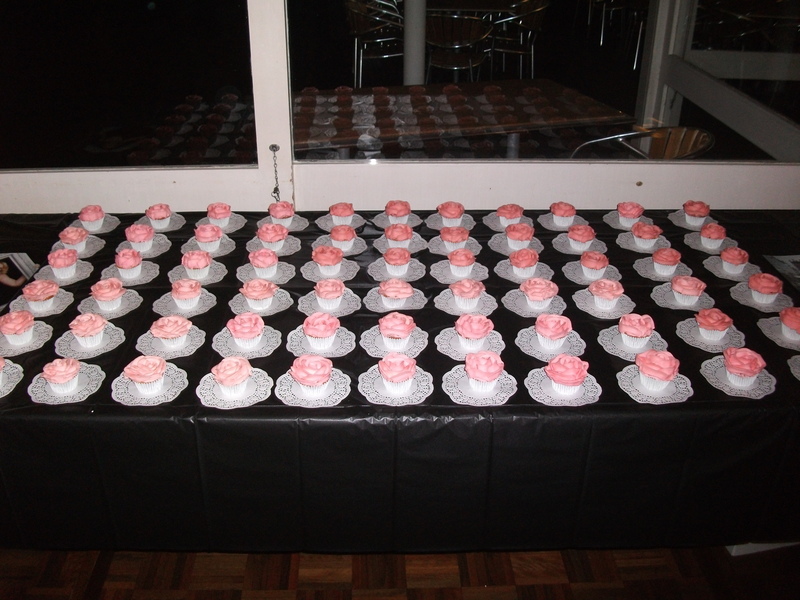 The above photo is my ruffle flower cupcake at the wedding. 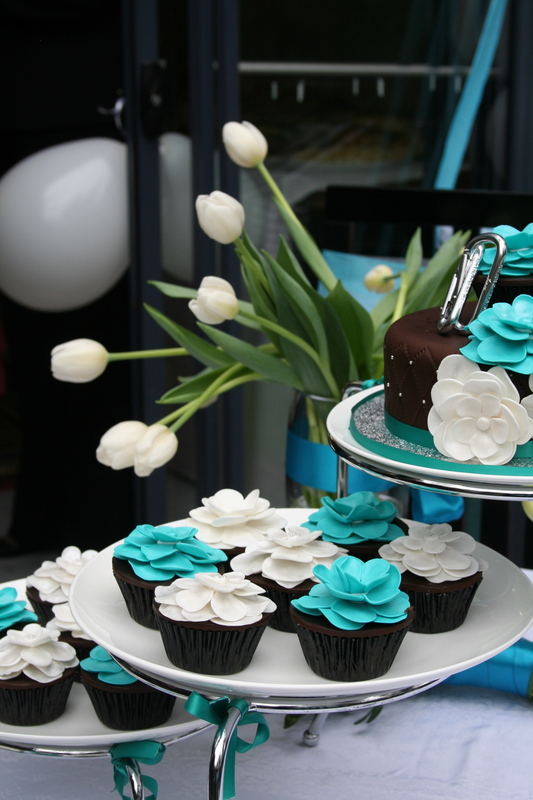 And what is even more impressive, without even trying the teal of the cupcakes, matched the teal in the wedding dress. I love this cake, with only one weeks notice, and an awesome client who talked for 2 hours going through every design aspect to give her friend an amazing wedding cake as a gift. Ok, I maybe a little biased. After this I had my birthday. Of course I made my cake which was a chocolate treacle cake (my favourite). 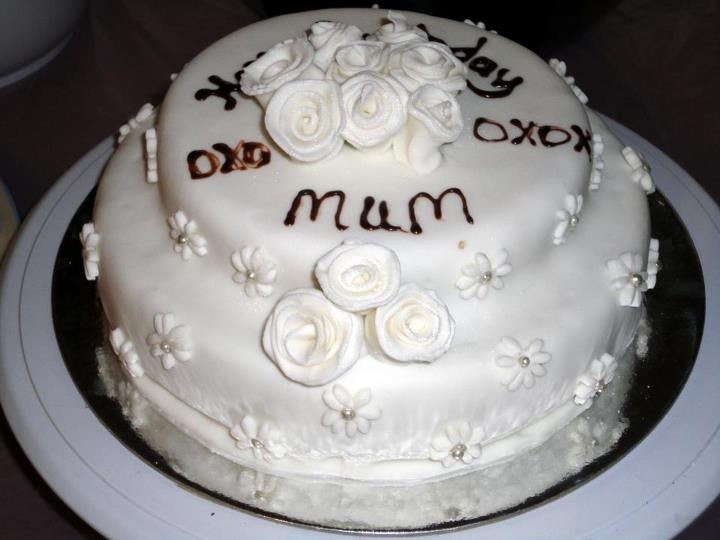 However my eldest daughter (9) decorated my cake with ribbon roses and flowers, and my youngest (3) decorated the chocolate cupcakes with chocolate and fondant flowers. My birthday cake decorated by my 9 year old daughter. As you can see, there is a definite cake decorating ability shining through my girls. In fact I will have to figure them out in the grand plan, of Hollipops Cakes & Daughters lol. 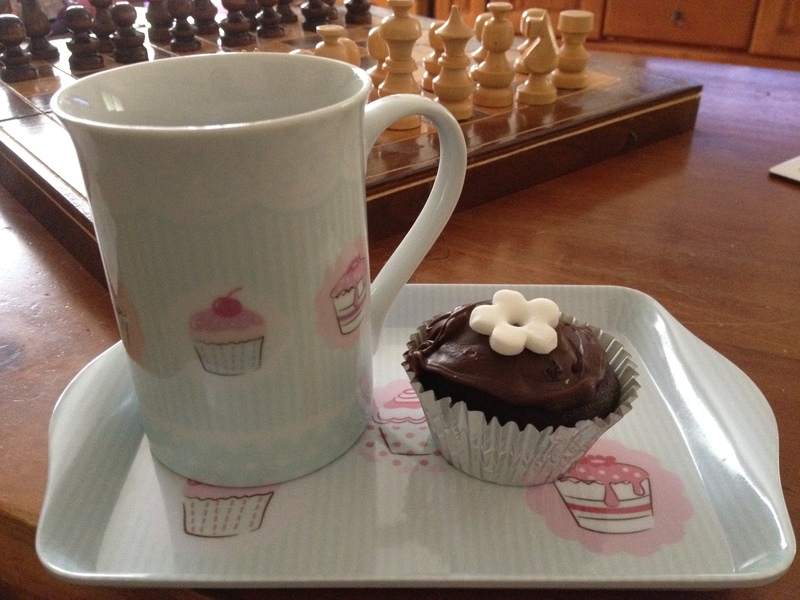 My 3 year old decorated my birthday cupcakes.I also got this cup and tray as a gift. back and help Mum in the bakery. Well that takes it to the beginning of May. As well as preparing my birthday cakes for what turned out to be a surprise party – again organised by my girls, I also baked, and decorated 45 chocolate mud cupcakes, with chocolate ganache. 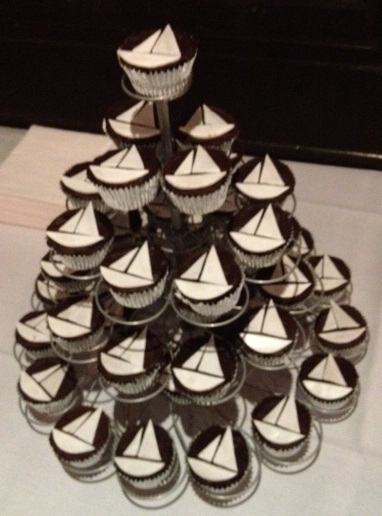 On top was a stylised sailboat design drawn up by the client. It initially just had the sails, but after a little playing I added the hull to give it a more of a sailboat look. After the celebrations had finished and I got to check out all my cool gifts, including a really nice Jamie Oliver apron and a tin of cupcake recipe cards, I then had to plan for my next order. 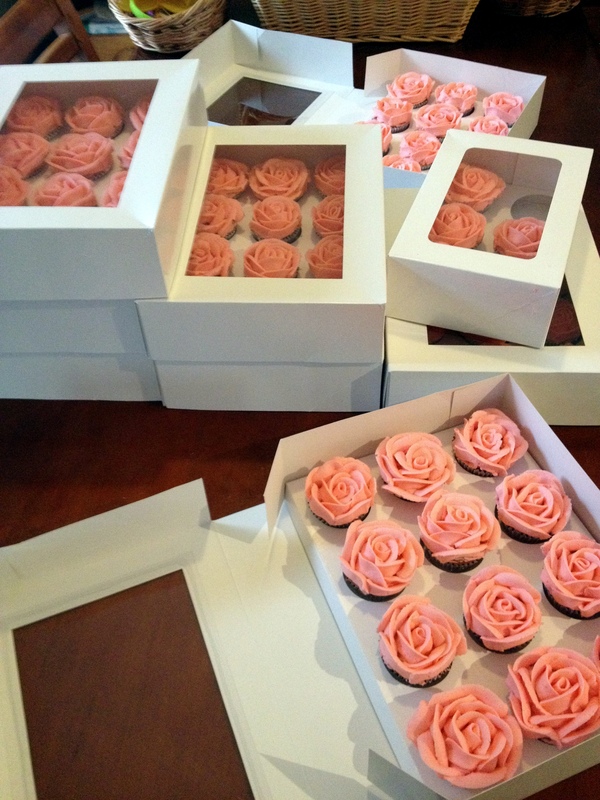 Which was 100 Roses Cupcakes for an engagement party. Each individual rose petal was hand piped. And admittedly I got a little cramp after piping what felt like hours. Once the last cupcake was finished and put into the box, I stood back and looked at what I’d achieved. They looked amazing, and I got some lovely compliments from the engaged couple and some others who were guests at the party, which brightened up my day. Which takes as up to present day. My next cake is next week, and it is going to be the Tardis from Dr Who. Which should be quite interesting to make. Inside will be chocolate pound cake with a chocolate-orange buttercream. There are decorations to put around the cake including a Dalek. And I’m looking forward to making a British icon. For now, I have recipes to write and organise, I need to cover 20 cake boards in various sizes that I got given to me yesterday. And most important before I head into my girls bedrooms to discover the mass of toys that they have yet to put away, I need a cup of tea.